Produced by the Austrian Mint since 2008, it has a face value of 1.50 Euro and has sold over 54 million units. 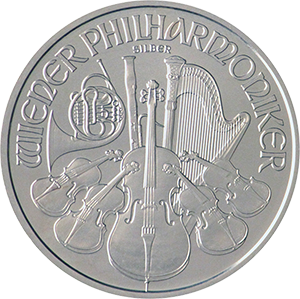 The Silver Philharmonic is one of three types of bullion coins produced by the Austrian Mint, the others being Gold and Platinum. The Philharmonic itself was first introduced in 1989, but it wasn’t until 2008 that a silver version was mass produced for widespread consumption. Such was the coin’s popularity that it sold more than 50m within the first five years of production. Over 7m were minted in its first year, which grew to 17m within three years. Due to market changes, including the global recession, this number has fluctuated recently, but the coin still sells by the millions year on year. The Silver Philharmonic’s design matches its gold counterpart and was created by renowned engraver Thomas Pesendorfer. This design has remained unchanged throughout the coin’s history and represents the Vienna Philharmonic on its obverse and inverse. It is this that gives the coin its name. 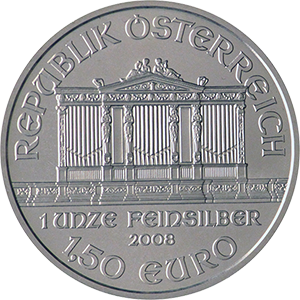 The obverse depicts an organ from the iconic Musikverein concert hall, while the inverse shows various musical instruments and the words “Wiener Philharmoniker”. The 1 oz Silver Philharmonic’s diameter measures 37mm and it has a thickness of 3.2mm. It weighs a total of 31.103g and, unlike the gold version, has a smooth edging. Like other precious metal versions of the coin, it is of high purity, 99.9ag, which makes it both a valuable and reliable option for investors. It’s face value is €1.50, but the coin’s precious metal content alone means it is far more valuable. The Silver Philharmonic typically trades at just above spot price (value of the coin’s precious metal content) and its popularity with collectors means it is likely to remain so. One of the world’s most trusted producers of bullion, the Austrian Mint is thought to provide high quality, high purity coinage that allows for great of peace of mind for investors.